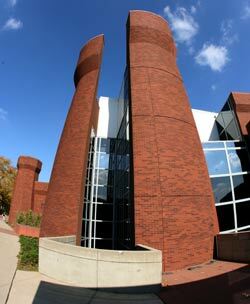 The Wexner Center is a multi-disciplinary arts center located on campus at The Ohio State Univesity. The Wexner Center provides a diverse array of contemporary arts, including visual arts exhibitions by major artists and emerging talents, films and videos by leading filmmakers of the past and present, and performing arts from around the world. 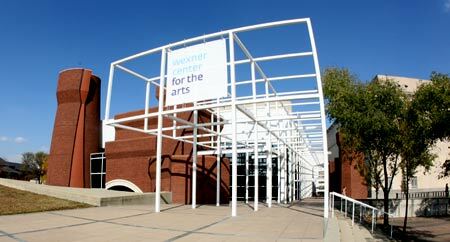 The Wexner Center's building was designed by architects Peter Eisenman of New York and the late Richard Trott of Columbus along with landscape architect Laurie Olin of Philadelphia. The intriguing design was selected through an international competition held by the university in 1982. The winning design emphasized links between the new center and its surrounding community. The building opened in November 1989 and has won international recognition. The towers on the south side of the center refer visually to a historic campus building known as the "Armory" that was once located on the site. According to the architects, the white metal grid along the east side, resemble the kind of scaffolding that typically encloses structures under construction. This reference infers that the building is an on-going entity and never quite finished. There are about 12,000 square feet of galleries, a 278 seat theater, a performance space with seating from 100-250, as well as studio space for film and video production, as well as a bookstore and cafe. Next door to the Wexner Center is Mershon Auditorium, which was completed in 1957 and became part of the Wesner Center complex. It will seat up to 2,500. Les Wexner was a major donor for the center, thus earning the right to have the building named for him. Les Wexner, who was born in Dayton, is better known for establishing The Limited. His first store was located in Kingsdale Shopping Center in Upper Arlington. Wexner graduated from the Ohio State University with a bachelor's degree in 1959. Portions of the Jodie Foster-directed film Little Man Tate were shot at the Wexner Center in 1991. Another large portion of the film, was shot at Miami University in Oxford, Ohio.